As Czechoslovakia was liberated from the Nazis at the end of World War II, the population of the country took its revenge - not on the Nazis themselves, but on three million of their fellow citizens. For centuries, three million ethnic Germans had lived in the Czech lands which became part of Czechoslovakia after World War I.
Clustered around the borders with Germany and Austria in the Sudetenland, they got along reasonably well with their Czech neighbours. 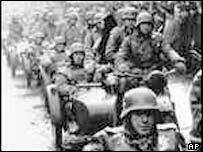 But as the Nazis were driven out of Czechoslovakia, it was open season on Germans - any Germans. Among those caught up in the violence that followed was a 15-year-old ethnic German Czech girl, Ingeborg Neumeyer. In the middle of the night, she and her family were evicted from their apartment in the city of Brno and sent on a death march. "We had no water, no food, and we were constantly forced on with whips and rifle butts. We were told to walk faster, faster. If somebody collapsed, they were shot or beaten with rifle butts. In the ditches by the roadside we could see many dead bodies. "We marched on, kilometre after kilometre. I had another problem-I was wearing three dresses because my mother had told me to wear them so I would have something spare to wear later, and we were not allowed to leave the road, we had to march on, even if you needed the toilet you had to do it as you walked. "I couldn't march any more and I went to the side of the road and tried to take off two of my dresses, but one of the Czech partisans saw me and beat me. I had blood coming out of my mouth and ears and nose. He took the dresses and threw them away, and threw away my shoes too." Across Czechoslovakia, thousands of ethnic Germans were murdered, raped and tortured, in the so-called "wild expulsions". According to Czech military historian Frantisek Hanzlik, the wild expulsions were in fact carried out on the basis of a government programme, and there was an official cover-up afterwards. As order returned to Czechoslovakia, the new president, Eduard Benes, put into operation a plan, hatched with the Allies during the war, to expel all 3 million Germans from the country without compensation. Agreed at Potsdam, this act of ethnic cleansing was openly sanctioned by Churchill, Stalin and Truman. But did the Sudeten Germans bring it on themselves? During the Czechoslovak communist era, they were rarely mentioned, or else depicted as Hitler's collaborators. They had not made themselves popular with the Czechs: in 1935, over a million of them voted for a nationalist German party which demanded unification of the Sudetenland with Germany. Zdena Nemcova was one of those who witnessed growing German militancy in the 1930s. She has no sympathy for the plight of the Germans after the war. "We hated them. People who had survived the concentration camps were returning and they were describing what happened to them there. The fact is that people hated the Germans, genuinely hated them so much that there was a spontaneous reaction, and the feeling was that if they liked the Third Reich so much, they could go there." It is arguable that the Sudeten Germans had some reason not to want to belong to a Czechoslovakia that, before the war, did not always treat them as equal citizens. Be that as it may, the Sudeten Germans found themselves squeezed between the Nazis who were false friends, the Czechoslovaks who wreaked disproportionate vengeance, and the victorious Allies who simply washed their hands. It may be too late to right the historic wrongs, but it is never too late to remember one of Europe's less honourable episodes. Europe's Forgotten War Crime was broadcast on Monday, 9 February, 2004 at 20:00 GMT on BBC Radio 4.